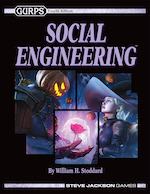 More than most supplements, GURPS Social Engineering drives home the importance of proper behavior; a PC who can't mind his tongue when talking to the king is likely to lose it to a torturer's knife! This is one of the challenges of roleplaying, and the reason why GURPS rewards players for choosing disadvantages. But what if it were possible to draw upon disadvantages as a source of strength as well? In addition to their usual effects, the GM may allow disadvantages to provide one or more harmony dice; see below for more on how to get them. Each harmony die can be used once per session to aid a success roll or reaction roll (but not a roll for damage or on a table). It represents your character accepting and embracing his disadvantage to such a degree that he can call upon it for inner strength or a bit of luck. You must explain how your disadvantage is going to help you make the success roll; e.g., "I'm going to use my Bad Temper harmony die on my Merchant roll, by being so gruff and caustic that he'll agree to my terms just to get me out of his shop." If the GM rejects your explanation, you don't lose the harmony die. Represent the harmony die with a different-colored die, then roll all four dice at once. For balance reasons, you cannot use Luck on this roll. You may then choose which three dice (out of the four) count for your roll! However, every time you use a harmony die, you're taking a risk. If the harmony die comes up lower than all the other dice (e.g., the harmony die rolls a 1 and the other dice roll 2, 2, and 4), you immediately and completely succumb to the disadvantage! Continuing the example above, you might lose all control of your temper, berate the merchant, and get thrown out of the shop. At a minimum, the roll critically fails and you're considered to have failed your self-control roll or otherwise "activated" your disadvantage in full. Leveled Perk: Each harmony die is a perk. You must specialize by disadvantage; e.g., Harmony Dice 2 (Gluttony). The level of this perk cannot exceed the associated disadvantage's value divided by -5, rounded down -- so you'd need Gluttony (6) to get two dice from it! Alternative to Points: Harmonious disadvantages provide dice instead of giving back points: one die for every full -5 points that the disadvantage would normally be worth. Because the trait does not give points, it does not count against any disadvantage limit. On-the-Fly Cost: Each harmony die costs one character point, which must be paid for out of the PC's earned or unspent points. It may then be applied to any disadvantage you have (as long as you can justify it for this roll). 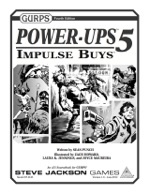 For alternatives to using character points, see GURPS Power-Ups 5: Impulse Buys. Because this method is so expensive, it shouldn't be combined with either limiting option below. Free, But Limited: Every player gets a certain number of "unspecialized" harmony dice for free. As long as he can justify using one of his disadvantages to help a given roll, he can use the die. The GM must set the limit; somewhere between one and three is recommended, or more if a limiting option (below) is added. Add either of these drawbacks to make the use of harmony dice a little less convenient. Karma: Every time you use a harmony die, the GM sets aside a disharmony die for his own later use. At any point, he may explain why your same disadvantage is now hurting a roll that you're making, and add the disharmony die to your pool! Roll all four dice, and then the GM will choose the worst three to use. He can't keep them indefinitely; each disharmony die expires if it's not used by the game session following the one in which it was earned (that is, if you use a harmony die this session, the GM has until next session to inflict a disharmony die on you). Choose Your Poison: When you use a harmony die, whichever of the four die results you don't use goes into the GM's arsenal, to be used as a penalty later on. This is similar to Karma, above, but it's a flat penalty rather than an extra die. For example, say your four dice roll 1, 3, 4, and 5, and you set aside the 5; now once, in the same game session or the next one, the GM may inflict -5 on any success or reaction roll you're about to make, as long as he can justify your disadvantage hurting your odds! Because of this, it's sometimes best to not choose the lowest roll; e.g., if you'd only needed to roll an 11 or less to succeed, you could choose the 1, 4, and 5, giving the GM only a -3 to use against you later.